I missed all the gorgeous sunlight yesterday, and today's a bit gloomy for photographs, but I'm going to forge ahead with the shop update as planned. It's all up there now, in the Etsy Shop! 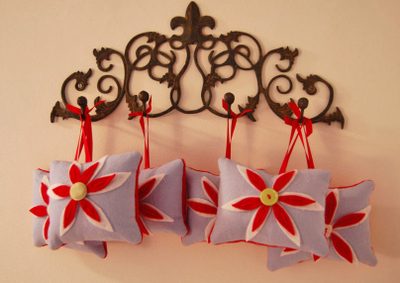 You'll find the placemats, coaster sets, and these yummy smelling little pillow / ornaments too. My hope is to add more throughout the weekend as I finish things up, but that may all get waylaid by plans of looking at lights, putting up a tree and other merriment of that sort. Priorities, you know. I'll leave the shop open until December 7th, and then close up until after the New Year.